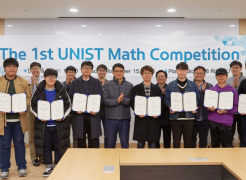 UNIST and PUST Sign MoU for Inter-Korean Acade..
“Mathematical Skills are Key to Survivin..
UNIST held an award ceremony to celebrate and recognize the individuals parcitipated in the 2018 UNIST Math Competition for Freshmen, which took place on November 15, 2018. 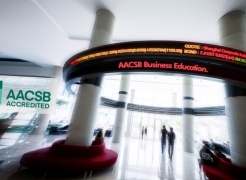 Organized by the Department..
UNIST Business School Earns AACSB Internationa..
UNIST has announce that its business schools have earned AACSB International accreditation from the Association to Advance Collegiate Schools of Business (AACSB), one of the world’s leading bu..
Student Graduation Works Exhibited at Design S.. 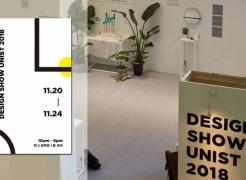 The annual design exhibition, entitled Design Show UNIST 2018, kicked off this afternoon, featuring the artworks created by imminently graduating students of Design and Human Engineering (DHE) and ..
Eleven Students Recognized with 2018 Kyungdong..
On November 19, UNIST held its annual Kyungdong Scholarship award presentation and ceremony to recognize and reward students who have demonstrated outstanding academic achievement. 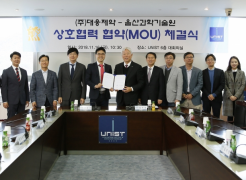 This year, the Kyu..
UNIST Signs MoU with Daewoong Pharmaceutical C..
UNIST signed an industry-academia cooperation agreement with Daewoong Pharmaceutical Co. Ltd. for AI-based new drug development. This partnership will contribute greatly to new drug discovery through .. 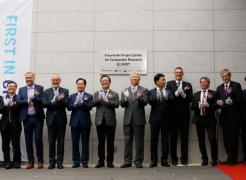 In the afternoon of November 7, UNIST held a grand opening celebration to commemorate the completion of Fraunhofer Project Center for Composites Research@UNIST (FPC@UNIST), the Korean branch of Fr..
UNIST to Hold the 4th Industrial Revolution Fo.. 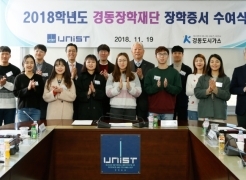 The 2018 4th Industrial Revolution Forum in Ulsan was held at UNIST from November 6 to 7, 2018. 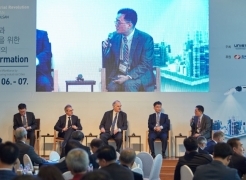 A heated discussion on the future of industrial cities in the fourth industrial revolution took place in Ulsan, the industrial powerhouse of South Korea. Organized by the Institute for the Fourth Ind..
Workshop to Share Inisights on Future Intellig.. The 2018 Smart Transportation Innovation Global Workshop will be held at UNIST on Wednesday, November 7, 2018. 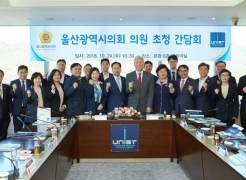 A heated discussion on the future of smart transportation will be held in Ulsan. 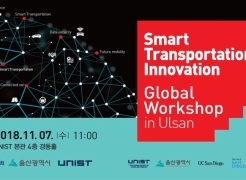 The 2018 Smart Transportation Innovation Global Workshop is scheduled to be held in the Main Administration Building of..
UNIST to Host a Roundtable Meeting with Ulsan .. 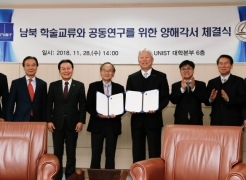 In the morning of October 24, UNIST hosted a roundtable event to discuss future cooperation schemes with Ulsan Metropolitan Council. The meeting, held in the main conference room of the Main Adminis..